It’s well-known that Jewish groups and activists have been the main force behind the war on Christmas and in generally getting Christianity out of the public square. So it’s no surprise that in Israel, Christmas fares even worse. In Jerusalem a large group of Heredim are threatening to boycott a fancy shopping mall. Why? Because it looks too Christmasy. The location of the mall near the Western Wall forces passersby to “real paganism”. The groveling of the owner of the mall rivals anything we see in the West for violations of political correctness. Because I don’t wish to hurt anyone, I agreed to first of all remove the green plastic, which was aimed at covering the electricity system’s cables, and because they interpreted it in a completely different way I decided to remove it. I apologize if I have caused anyone injustice. So the problem was the disgusting green covering up the wiring. Imagine the horrors if that green was somehow accidentally paired with red! Just to show his heart is in the right place, the mall owner assured the public that “Christmas trees were never placed in the mall and will never be seen there.” Not to be outdone, the mayor of Nazareth also banned Christmas trees in public places in Arab Christian areas. Something for the Christian Zionist dupes to think about. Or perhaps this is a sign that the End Times are near. 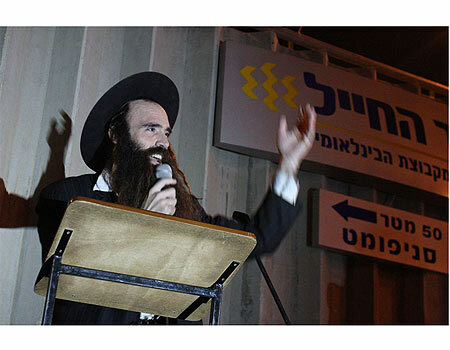 Caption of op-ed by YNET: "Rabbi speaks at anti-Arab protest"
Looks like a Haredi to me. Obviously these young Jews were doing G-d’s work.